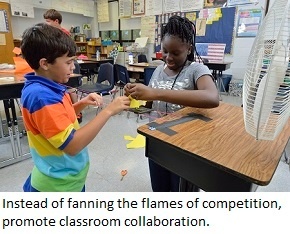 Ask EiE: Are Contests OK in the Engineering Classroom? Each Thursday on the EiE Blog we offer tips for teachers of elementary engineering. To answer today's question, let's take a look at Lesson 3 of the Engineering is Elementary (EiE) unit Catching the Wind: Designing Windmills. This lesson engages students in designing sails with different shapes from a variety of materials. Once their sail is constructed, kids attach it to a little raft mounted on a track, turn on an electric fan to generate “wind,” and measure how far their raft sails down the track. Often, teachers like to set up more than one sail track, so that testing can proceed faster . 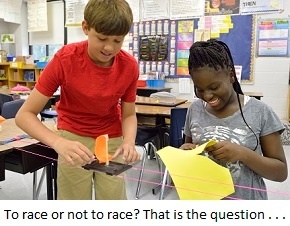 . . but then students ask if they can race. Should you let a sailboat race be part of the activity? See it in action: Watch this lesson! Allowing for classroom competition is a traditional approach to learning, and in some situations it can be very effective. But when elementary school-aged kids engineer, it’s optimal to put the emphasis on collaboration. Let’s take a look at the evidence on both sides. Competition Can Be Fun, But . . .
On the one hand, competitions can be really fun—they generate excitement and drama. Competition is motivating for some students; winners feel great because their designs worked well. And some educators argue that competition in the classroom prepares kids for the future, that when students eventually graduate into the world of work, they’ll experience competitive situations, so they should be ready and resilient. But when your classroom activities emphasize competition, the students who don’t win may feel frustrated, angry, and turned off. Life deals different hands; realistically, the deck is stacked to favor kids from certain demographics . . . and the kids themselves know it. Everyone brings different experiences, backgrounds, and skills to their school activities, and competitions can unintentionally emphasize or reinforce these differences. On top of the issue of equity, for some students fear of failure can become paralyzing. If you’re not likely to win, why even try? Even the kids who often win can be adversely affected by competitions; they may become obsessed with worry over what will happen if they don’t win the next time. Also, when your teams of student engineers compete against each other, it affects the group dynamics inside each team. Students may see their teammates less as actual teammates (as members of a learning community), and more as tools (or obstacles) to winning. Kids who are focused on winning—doing it faster, getting the best result—may feel that positive classroom practices like discussing and reflecting just aren’t worth the time, that they slow the trajectory of getting to a successful solution. Kids who share offbeat ideas that are outside the box may feel sanctioned, not supported. Think about what you hope students will take away from engineering lessons. Competitions tend to put the emphasis on outcome over process: learning in order to get a reward, as opposed to learning for the satisfaction (and long-term benefit) of learning. We strongly recommend that when your young students are engineering, you keep things collaborative. First of all, that’s what engineers really do: work in teams, share information, and use group knowledge to come up with the best solutions. Secondly, when you help young students develop the 21st century skills of cooperation, collaboration, and effective communication, these skills will help them succeed as they continue through school . . . and on into the modern world of work. When you promote cooperation in the classroom, you help to build a future where this approach is respected and effective. One other key benefit of promoting collaboration: There’s plenty of research to show that when students work together—when they collaborate and engage in peer teaching—they actually learn better. Different students have different strengths, and collaborating on a design challenge lets everyone bring those strengths to the table. It’s smooth sailing all around.